The role of mitochondria in the initiation and progression of cancer has long been debated, but it is generally accepted that mitochondria play an important role in cancer through replication and energy production. Identifying the important roles that mitochondria play in cancer development and progression can possibly help identify ways in which repairing mitochondrial function may be used for therapeutic benefit. Many cancer researchers tend to seek a reductionist approach in their research: the theory that condenses complex biological phenomena into their many parts, so we can understand a single cause and devise a cure. However, once reduction is done, there may be incentive for unification of theories to create a more holistic approach to cancer treatment. The mitochondria may be the gateway for this alternative approach. This article will review the history of mitochondrial-cancer research as well as various, promising, non-toxic approaches to altering mitochondrial function in cancer cells, such as low-carbohydrate diet and fermented wheat germ extract nutrition. The mitochondria, home of the Krebs cycle or tricarboxylic acid cycle (TCA), are maternally-inherited, cytoplasmic organelles having evolved from symbiotic bacteria. (1) Containing only 37 genes, they are known as the powerhouse of the cell for their role in producing chemical energy or adenosine triphosphate (ATP). By oxidizing (losing an electron) the fat, protein, and carbohydrates we consume through food and drink, they create energy-abundant molecules for the cell. These biochemical processes are known as cellular respiration. Within the TCA, substrates such as oxygen and glucose are converted, through enzymatic processes, first into pyruvate, then acetyl-CoA and ultimately lead to the production of an ATP molecule, water, and carbon dioxide. Figure 1: Vander Heider MG et al. Understanding the Warburg effect: The metabolic requirements of cell proliferation. Science. 2009. 324(5930):1029–1033.6 This image shows normal cell respiration via OXPHOS, Anaerobic glycolysis, when oxygen is not available, and the cancer cell's energy cycle termed as the Warburg effect or 'Aerobic glycolysis'. Normal cells produce energy through mitochondrial oxidative phosphorylation (OXPHOS). When oxygen is not available, they produce energy via the less efficient route of anaerobic glycolysis. In the 1920s, Otto Warburg observed that cancer cells do not produce energy in the efficient way that normal cells do. Rather, cancer cells produce most of their energy through an inefficient, high rate of glycolysis and glutaminolysis(4) followed by fermentation of lactate into lactic acid. 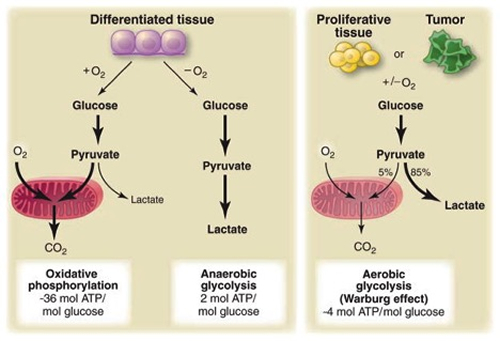 Glucose and glutamine metabolites are then diverted from producing ATP to a process to promote cell proliferation. This process was coined by Warburg himself as aerobic fermentation, which has been adapted to 'aerobic glycolysis', and commonly known as the Warburg Effect. Since lactate production is considered an indicator of respiratory insufficiency in biological systems,(5) Warburg assessed aerobic production of lactate in cancer cells as a gauge of respiratory insufficiency. (Differentiated cells produce large amounts of lactate only under anaerobic conditions.) This observation, as we will see is a controversial one, not so much as to the involvement of the mitochondria in cancer, but at what point they become involved in the process, and whether they are functioning. All evidence supports the Warburg effect - whether causal or not - as constant in the initiation and/or progression of cancer. Some research argues against a reductionist model, while still upholding the majority view that cancer begins with the SMT, progresses to the microenvironment and then to the mitochondrion. (9) It has been elucidated that cancer will select against the genes with the highest consumption of free energy. An alternate holistic model suggests that the underlying mechanisms of deregulated cellular metabolism are associated with, but not necessarily caused by, mitochondrial dysfunction, and that mitochondrial dysfunction can promote cancer progression to an apoptosis-resistant or invasive phenotype through a variety of mechanisms. (12) Seyfried's holistic model is in accordance with the somatic mutation as an event that follows mitochondrion disruption. This research allows him to conclude that respiratory insufficiency is the origin of cancer, and that the other initiation theories, including the SMT, arise either directly or indirectly from insufficient respiration. (12) In later research Seyfried postulates that a major weakness in the effort to cure cancer is due to the confusion surrounding the initiation theories. He believes that without a unifying agreement of how cancer arises, it becomes difficult to formulate a successful plan for effective treatment and prevention. (5) Considering the aforementioned statistic of cancer initiation, from a reductionist perspective, it would be most appropriate to address the mitochondrion theory. Many vital cellular parameters are controlled by mitochondria. These include regulation of energy production, modulation of oxidation–reduction (redox) status, generation of reactive oxygen species (ROS), contribution to cytosolic biosynthetic precursors such as acetyl-CoA and pyrimidines, and initiation of apoptosis through the activation of the mitochondrial permeability transition pore and Cytochrome C. Changes in these parameters can shift the cell from a dormant state of differentiation to a proliferation state. (1) Below, the mitochondrial disruptions are categorized but bear in mind that they overlap and should be considered a locus in the greater process or state of cancer initiation. There are many thorough investigations and positions on the role of mitochondrial dysfunction in cancer(1,10,11,16,17) and following is a summary. Genetic Mutations. Cancer cells have been shown to display genetic and epigenetic mutations that activate irregular programs that are important in development, stress response, wound healing and nutritional status. (2) Cancer cells optimize the cancer cell environment by reprogramming adjacent cells for their benefit, using retrograde signaling. (1) Some research claims that functional mitochondria are essential for the cancer cell. (1,8,9) When mutations in mitochondrial genes are present, which is often in cancer cells, they alter the mitochondrial bioenergetic (i.e. oxygen rate and extracellular acidification rate) and biosynthetic state (i.e. cell proliferation), rather than inactivating mitochondrial energy metabolism (i.e. glycolysis, glutaminolysis, ATP). Redox Reactions and Glycolysis. Reactions involving electron transfers are known as oxidation-reduction reactions or redox reactions for which OXPHOS is the metabolic pathway. A redox reaction occurs as a result of two smaller reactions; one molecule loses one or more electrons, and simultaneously gains an oxygen atom, to become oxidized and another molecule gains an electron and loses an oxygen atom to become reduced. Cancer cells have an amazing tendency to reprogram their metabolic capability by inhibiting OXPHOS to elevate glycolytic metabolism. There is a therapeutic opportunity for inhibiting glycolysis to shift cellular metabolism to OXPHOS(20) oxidizing NADH to ATP instead. Cancer is a genetic disorder and yet the common denominator may be controlled by mitochondria function. (5) Since the mitochondria have so few parts to them, are such a major role in tumorigenesis or so scientists believe, they are an obvious target for therapeutic opportunities. New drugs are being developed to inhibit mitochondrial respiration of cancer cells and induce mitochondrial structural damage. (13) Nutrition may offer a successful holistic therapeutic opportunity for cancer treatment by 1) providing targeted TCA cycle intermediates, 2) affecting whole body biochemistry and improving quality of life, 3) offering more than one mechanism of action or 4) acting as adjuvants for medical treatments. By focusing on the needs of the mitochondria to regulate energy production by oxidizing the fats,carbohydrates and proteins we consume, nutrients may recreate the therapeutic energy required to inhibit cancer proliferation. In many cancers the damage on normal cells seems irreversible, but there maybe a nutritional vista to advance cancer treatments by rescuing the mitochondrial function of cancer cells. In the Townsend Letter, Aug/Sept 2016 edition, Dr. Greg Nigh details several potential mechanisms of action for FWGE's anticancer ability, as well as expands clinical research. (25) To review, early evidence shows that FWGE is a holistic and available natural therapeutic with an abundance of mechanisms. FWGE promotes apoptosis directly by increasing levels of Cytochrome C as well as indirectly by cleaving PARP, a family of proteins, which prevent cancer cells from repairing DNA. Second, FWGE influences cancer cell proliferation by inhibiting glycolysis. These metabolic modifications promote cell differentiation to normal cell phenotypes in some cells, whereas in others, promotes apoptosis. FWGE also inhibits the enzyme glucose-6-phosphate dehydrogenase, a metabolic enzyme essential for using glucose carbons to make ribose through the pentose phosphate pathway mentioned above. FWGE may virtually eliminate cancer cell proliferation through inhibition of both major and minor pathways of cancer cell synthesis of ribose. Lastly, FWGE rescues mitochondria, via apoptosis. The inhibitory effects on glycolysis from FWGE can probably be explained by looking at the effects that FWGE has on mitochondrial function. As with other metabolic therapies, FWGE induces cancer cells to engage in mitochondrial OXPHOS so they produce energy like a normal cell. (25) Additionally, FWGE delays cell formation and growth associated with impaired glucose utilization, which leads to autophagy, a normal process whereby cancer cell components die in favor of healthy cell formation. During cellular stress the process of autophagy is significantly increased, a discovery that may provide an additional mechanism into the potential therapeutics of FWGE on cancer cell metabolism. (28) FWGE may show even further therapeutic potential by decreasing lactic acid, increasing oxygen consumption rate, and increasing Cytochrome C disbursement from the cancer cell, leading to apoptosis. Mitochondria have been an underestimated player in the initiation and progression of cancer, but it is generally accepted that mitochondria play an important role in cancer through macromolecular synthesis and energy production. As indicated in this article, first by acknowledging then identifying the important function that mitochondria play in cancer development and progression, we can discover holistic ways in which repairing mitochondrial function may be used for therapeutic benefit. Two strong nutrition therapies, the ketogenic diet and fermented wheat germ extract were highlighted. Michael Karlfeldt, ND, PhD, runs a busy Integrative medicine center, The Karlfeldt Center, in Boise, Idaho, focusing on naturopathic oncology, autoimmune disorders, chronic infections, brain and neuroinflammatory conditions, anti-aging, and preventative medicine (www.TheKarlfeldtCenter.com). He was born in Sweden and has been in clinical practice since 1987. He was the host of the Dr. Michael Show, which aired 100 episodes discussing important health-related topics. Currently, he hosts the tv show True Health: Body, Mind, Spirit(www.truehealthshow.com), available on Amazon Prime, and the radio show HealthMade Radio where he connects with international leaders in the integrative health arena. He is also the founder of the health hub HealthMade (www.HealthMade.co), a trusted resource for health education, proven treatments and customized preventative and prescriptive programs for the modern health-minded consumer. Additionally, he is spearheading mobile texting technology for holistic practitioners to educate, connect and interact with their consumers in regard to their treatment plan, therapies available, nutritional supplements, and diet. 1. Wallace DC. Mitochondria and cancer. Nat Rev Cancer. 2012 Oct; 12(10): 685–698. 2. United Mitochondrial Disease Foundation. What is mitochondrial disease. http://www.umdf.org/what-is-mitochondrial-disease/. Accessed 5/8/2018. 4. Ziello J, Jovin IS, Huanga Y. Hypoxia-Inducible Factor (HIF)-1 Regulatory Pathway and its Potential for Therapeutic Intervention in Malignancy and Ischemia. Yale J Biol Med. 2007 Jun; 80(2): 51–60. 5. Seyfried TN, et al. Cancer as a metabolic disease: implications for novel therapeutics. Carcinogenesis. 2014 Mar; 35(3): 515–527. 6. Vander Heider MG, Cantley LC, Thompson CB. Understanding the Warburg effect: The metabolic requirements of cell proliferation. Science. 2009. 324(5930):1029–1033. 7. Hanselmann RG, Welter C. Origin of cancer: An information, energy, and matter disease. Front Cell Develop Biol. 2016; 4: 121. 8. Potter M, Newport E, Morten KJ. The Warburg effect: 80 years on. Biochem Soc Trans. 2016 Oct 15; 44(5): 1499–1505. 9. A. Cancer is an adaptation that selects in animals against energy dissipation. Medical Hypotheses. 2017; 104: 104–115. 10. Memorial Sloan Kettering Cancer Center. Drug targeting genetic mutation works across all tumor types. June 3, 2017. https://www.mskcc.org/blog/asco17-drug-targeting-genetic-mutation-works-across-all-tumor-types. Accessed 5/8/18. 11. Hsu CC, Tseng LM, Lee HC. Role of mitochondrial dysfunction in cancer progression. Exp Biol Med (Maywood). 2016 Jun; 241(12): 1281–1295. 12. Seyfried TN. Cancer as a mitochondrial metabolic disease. Front Cell Dev Biol. 2015; 3: 43. 13. Greer YE, et al. ONC201 kills breast cancer cells in vitro by targeting mitochondria. Oncotarget. 2018; 9:18454-18479. 14. Schmidt M, et al. Effects of a ketogenic diet on the quality of life in 16 patients with advanced cancer: A pilot trial. Nutr Metab (Lond). 2011; 8: 54. 15. Hanahan D, Weinberg RA. Hallmarks of cancer: the next generation. Cell.144;2011 , 646–674. 16. Zong WX, Rabinowitz JD, White E. Mitochondria and Cancer. Molecular Cel. 2016;61:667-673. 17. Marie SKN, Oba-Shinjo M. Metabolism and Brain Cancer. Clinics (Brazil) 2011;66(S1):33-43. 18. Nigh G. Cancer as Adaptation: Rethinking the Cause and Treatment of Malignancy. Townsend Letter. Aug/Sept 2016:37-40. 20. Kalyanaraman B, et al. A review of the basics of mitochondrial bioenergetics, metabolism, and related signaling pathways in cancer cells: Therapeutic targeting of tumor mitochondria with lipophilic cationic compounds. Redox Biol. 2018; 14: 316–327. 21. Wen S, Zhu D, Huang P. Targeting cancer cell mitochondria as a therapeutic approach. Future Med Chem. 2013 Jan; 5(1): 53–67. 22. Goodsell DS. The Molecular Perspective: Cytochrome c and Apoptosis. The Oncologist. 2004;9(2):226-227. 23. Allen BG, et al. Ketogenic diets as an adjuvant cancer therapy: History and potential mechanism. Redox Biol. 2014; 2: 963–970. 24. Khodadadi S, et al. Tumor Cells Growth and Survival Time with the Ketogenic Diet in Animal Models: A Systematic Review. Int J Prev Med. 2017; 8: 35. 25. Nigh G. Cancer as Adaptation: Rethinking the Cause and Treatment of Malignancy. Townsend Letter. Aug/Sept 2016:37-40. 26. Marcsek Z, et al. The Efficacy of Tamoxifen in Estrogen Receptor–Positive Breast Cancer Cells Is Enhanced by a Medical Nutriment. Cancer Biother Radiopharm. 2004;19(6):746-753. 27. Wang CW, et al. Preclinical Evaluation on the Tumor Suppression Efficiency and Combination Drug Effects of Fermented Wheat Germ Extract in Human Ovarian Carcinoma Cells. Evid Based Complement Alternat Med. 2015: 570-785. 28. Otto C, et al. Antiproliferative and antimetabolic effects behind the anticancer property of fermented wheat germ extract. BMC Complement Altern Med. 2016;1:16-160. 29. Memorial Sloan Kettering Cancer Center. Wheat Germ Extract. https://www.mskcc.org/cancer-care/integrative-medicine/herbs/wheat-germextract. Accessed 5/6/18. 30. Jakab F, Shoenfeld Y, Balogh A, et al. A medical nutriment has supportive value in the treatment of colorectal cancer. Br J Cancer. 2003;89:465–469. 31. Barabás J, Németh Z. The opinion of Hungarian Association of Oral and Maxillofacial Surgeons (Magyar Arc-, Állcsont- és Szájsebészeti Társaság) on the justification of supportive treatment of patients with tumorous diseases of the oral cavity. Hung Med J. 2006;147(35):1709– 1711. 32. Demidov LV, Manziuk LV, Kharkevitch GY, Pirogova NA, Artamonova EV. Adjuvant fermented wheat germ extract (Avemar) nutraceutical improves survival of high-risk skin melanoma patients: a randomized, pilot, phase II clinical study with a 7-year follow-up. Cancer Biother Radiopharm. 2008;23(4):477–482.